Exchange 2010 has many new features, advance administration methods, significant changes in Information Store to give better performance, new and simple high-availability approach and role based access control features for permissions. Sounds great so who doesn’t want to start testing this early version, Exchange 2010 Beta1. As we know that Exchange 2010 product is still under development and being optimized, so here are certain FAQs, Tips and Known Issues which might help you to evaluate it easily and save your time while finding solutions or workarounds on some common queries and issues. First question comes in your mind while testing Exchange 2010 Beta1 is, can I use Exchange 2010 Beta 1 in production? ~ Answer is "NO", here is an official article from Exchange Team on why you shouldn’t use Beta in production environment. Reference: "Can I install Exchange 2010 Beta in production?" 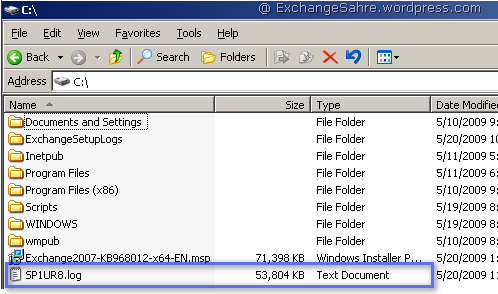 2.1 Can I install Exchange 2010 on Windows 2008 Server Core? ~ No, Exchange 2010 can NOT be installed on Windows 2008 Server Core, it requires full edition of Windows 2008 Standard or Enterprise. ~ Reason is, Exchange requires some of the components which are not supported on Windows 2008 Server Core, example is .Net Framework. 2.2 Can I use Exchange 2010 Beta 1 with Windows 2008 R2? ~ Yes, you can use Windows 2008 R2 but read below couple of points. 2.2.1 Which build of Windows 2008 R2 I can use for Exchange 2010 testing? Exchange 2010 Beta1 PowerShell & WinRM are incompatible with post 7000 build of Windows R2 and requires wire-level change so it can be installed only on build 7000 of R2 and not on later builds so keep in mind if you are planning to install it on R2. 2.2.2 You may get below error while accessing EMC on Windows 2008 R2. Connecting to remote server failed with the following error message : The WinRM client received an HTTP server error status (500), but the remote service did not include any other information about the cause of the failure. It was running command ‘Discover-ExchangeServer -UseWIA $true’. ~ Disable “Anonymous Authentication” on PowerShell virtual directory of IIS. 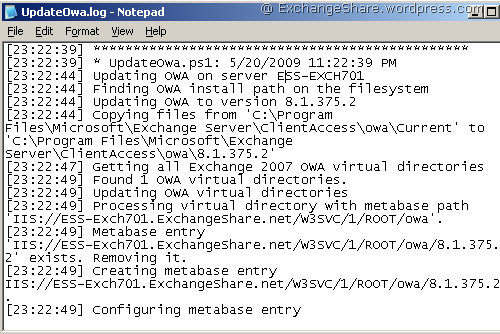 Coexistence with legacy Exchange versions (2007or 2003) is NOT supported with Exchange 2010 Beta1. We may need to wait for next release of Exchange 2010. 4.1 Domain & Forest Functional Levels of your AD environment. Exchange 2010 requires Domain and Forest (both) Functional Levels to at least Windows 2003. You can refer below articles to raise Functional Levels of your AD to Windows 2003. 4.2 Setup fails at Hub Transport Server role installation with below error. ~ This could be because you have disabled IPv6 in Local Area Connection. 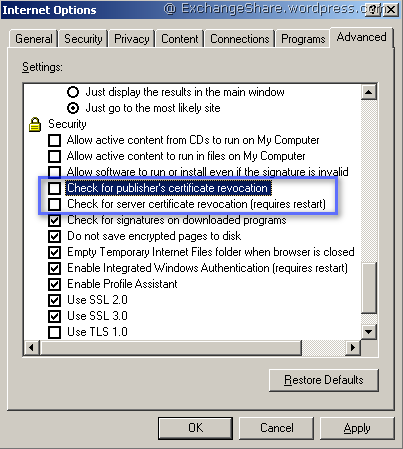 Correct method to disable IPv6 is with Registry Key and remove the entry from hosts file. 4.3 You get below error while running installation. "An error occurred while copying file D:\Exchange2010-Beta1-x64\…\templates editor.msc"
~ Copy Setup dump to local hard drive and execute Exchange 2010 setup from there. ~ Make sure that account, being used to run Exchange 2010 setup, has Domain, Enterprise and Schema Admin rights. 4.4 You may get below error while installing additional Mailbox Server in Exchange 2010 Beta1 environment. ~ This might be due to "Admin Audit Log Agent" Cmdlet Extension Agents enabled in your environment. This will be resolved in later builds but current Workaround for this problem is disable Admin Audit Log Agent with below cmdlet. Disable-CmdletExtensionAgent "Admin Audit Log Agent"
5.1 When you try to access EMS/EMC with newly created administrator account, you get below error. You need to enable Remote Powershell for newly created Admin account with below cmdlet. 5.2 When you click on CAS Server properties you may get below error. Unable to create IIS (Internet Information Service) directory entry. Error Message is: Access is denied.
. HResult = -2147024891 It was running command ‘get-ActiveSyncVirtualDirectory’. This is know issue with current Beta1 and you need to add "Microsoft Exchange Security Groups\ Exchange Trusted Subsystem" group to Local Administrators group on all Exchange servers and Restart the CAS server. 5.3 If you create User with ADU&C and enable mailbox with EMC/EMS, now while removing the same mailbox in EMC you get below error. Active Directory operation failed on Server1.Contoso.com. This error is not retriable. Additional information: Access is denied. Solution: You need to use EMS to remove the mailbox with Remove-Mailbox cmdlet. 5.4 How to manage mailbox folder permission with EMS. This is one of the New Mailbox and Recipient Functionality in Exchange 2010. Let’s take an example here, if you want permission on a folder named "SharedFolder1" of User1’s mailbox to User2 in Exchange Management Shell. ~ You can use Add-MailboxFolderPermission cmdlet. But what is the format of folder name which we should pass in cmdlet to give permission? So, format should be blow. 6.1 How can I access Exchange 2010 mailbox? ~ You can access mailbox with MAPI clients like Outlook 2007 or 2003, OWA premium experience with IE, FireFox & Safari browser or Windows Mobile 5.0, 6.0 devices. 6.2 Outlook 2007 is not able to access mailbox and/or unable to start "MSExchange Rpc Client Access" Service. This is know issue and it will be corrected in later build. Workaround is to add below two registry keys on Exchange 2010 Server. 6.3 Outlook 2003 is unable to access mailbox. RPC/MAPI Mailbox access with Outlook 2003 may not work while testing in Beta1, you need to use Outlook 2007 to gain mailbox access. You may use RPC/HTTPs method with Outlook 2003 to access Mailbox. Public Folder is fully supported in Exchange 2010 life cycle as Exchange team is already announced earlier. But you need to start looking for other alternative if PFs are being heavily used in your organization, Share Point is a good alternative from that stand point. 7.2 Where is Public Folder option in OWA? Public Folder, Notes, Tasks, Views etc… modules are not included in current Beta, these will be available in later builds. 7.3 Unable to access Public Folder in Outlook 2007 and you get below error. "Cannot expand the folder. The set of folders cannot be opened. Your profile is not configured"
Public Folder access has problem with MAPI/RPC Outlook 2007 profile and can not be accessible, this will be corrected in later build. 8.1 Certain features (like drag and drop items) are not yet fully implemented in this version of Beta to work on Firefox and Safari web browser so you can still find some gaps and which will be covered by RTM. 8.2 OWA, where is integrated IM and Presence functionality? ~ IM & Presence functionality is not yet included into Beta1 so we may need to wait for next build releases. You may need to reinstall CAS server role and IIS. 9.1 When you click on Options in OWA to login on ECP, again it asks for authentication. ~ This is expected behaviour in Beta1 because ECP virtual directory doesn’t support FBA yet. This will be corrected by RTM releases of Exchange 2010. 9.2 Authentication fails when you click on Options button in OWA and you get below error. Unexpected Error – An error occurred and your request couldn’t be completed. Please try again. ~ This happens if you are accessing OWA with FQDN of your OWA address like https://mail.domainname.com/owa but didn’t set urls on virtual directories. ~ You need to set InternalURL to https://FQDNofExchange/OWA and ExternalURL to https://mail.domain.com/owa of OWA virtual directory with Set-OWAVirtualDirectory cmdlet. ~ Similarly for ECP directory with Set-ECPVirtualDirectory cmdlet. Once these are configured it prompts for passwords (Refer #9.1) and authentication redirects to ECP. 10.1 How to create Archive Mailbox? You can use below cmdlet to create archive mailbox. In later builds you can create archive mailbox in EMC too. 10.2 Where will be Archiving mailbox created? ~ Archive mailbox will be created automatically on the same mailbox database where primary mailbox of user is available. 10.3 Does discoveries feature work on Archive mailbox to find emails by Compliance Officer? Yes, Compliance Officer can search emails from Archive Mailbox. Exchange Control Panel (ECP) is an interface for Discovery feature of Exchange 2010. 10.4 How to access Archive Mailbox? It can be accessed via OWA or Outlook 2010 but unfortunately OWA doesn’t have that feature included in current Beta1 to access Archive Mailbox and beta version of Outlook 2010 will be released in Q3 so we may need to wait until next build of Exchange 2010 available. 11.1 What are supported clients for MailTips feature? ~ MailTips are supported in OWA and Outlook 2010. 12.1.1 You get below error while adding a server into DAG by using EMC. Insufficient permissions to view the network shares on machines <FileShareWitness>. Error code 5. ~ This is known issue, remote powershell can add a server in DAG since it requires to install Windows Failover Cluster (WFC) components which are not accessible through remote powershell. ~ Use "Exchange Management Shell (Local Powershell)" to add the server into DAG with Add-DatabaseAvailabilityGroupServer cmdlet. 12.2 What is the alternative of Recovery Storage Group (RSG)? ~ As we know that there Storage Group concept is deprecated and we have only Databases so now we can use Recovery Databases for recovery purpose. ~ Here are cmdlets to create Recovery Database and to restore mailbox. If you have any comment or suggestion about this article, tips to be included here then drop a line in comment area.